The BlackBerry Athena is here atlast and its official name is Key2. BlackBerry (or should we say TCL) at a special event held in New York today announced the KEYone successor after several leaks in the past few days. The phone inherits the rectangle-shaped body and squar-ish display from its predecessor and also the four-row physical QWERTY backlit keys. The physical keys, however, has been made 20-percent larger for comfortable typing. Furthermore, the keys are touch-responsive, gesture-enabled and now supports flick typing. The spacebar key at the bottom sports a fingerprint sensor underneath as seen on KEYone, but there's also a dedicated key on the Key2 that can be customized to launch select app or contact in one tap. BlackBerry called it the "Speed Key". The screen size is still 4.5-inch and the display resolution is Full HD (1080p). The aspect ratio remains 3:2, but the Key2 is powered by a faster Snapdragon 660 chipset coupled with up to 6GB of RAM. For the first time, BlackBerry has embraced the dual rear camera system with the Key2. Sitting at the back of the phone is 12MP+12MP dual camera accompanied by a dual-tone LED flash, while it sports an 8MP front-facing camera. 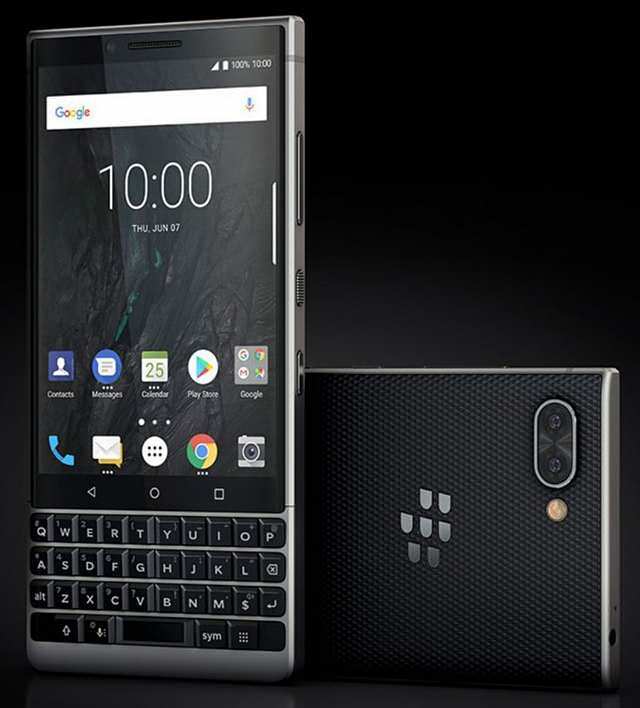 Design-wise, the BlackBerry Key2 has a soft-texture back with Diamond pattern and a 7000 series aluminium frame. It runs Android 8.1 Oreo and packed a 3360mAh battery with support for fast charging. The BlackBerry Key2 will cost US$649 in the U.S, €649 in Europe, £579 in the U.K, while Canadian will purchase it for CA$829. Global availability is set for this month.